"A true story finally worth telling"
Publisher Digerati as of late has been working tirelessly with many developers to help bring their visions for games to a wider audience over on the Xbox platform. One such game that could potentially fly under the radar for many gamers is iNK Stories 1979 Revolution: Black Friday. A Small but creative title that tells the story of one mans view point of events that led to the 1979 Black Friday riots in Istanbul. Whilst point and click titles seem to becoming a growing trend again in this modern era, especially after the rise of Telltale made games where you essentially pick your own adventure from an interactive movie standpoint. Can 1979 Revolution stand out on its own two feet. And most importantly, is this a game you should care about just like the events that inspired it? Let us wait no further as delve into our review. 1979 The Resistance takes a lot of its gaming cues from adventure titles that came before it. This title does heavily play like a Telltale game, but somehow manages to tell an emotional story whilst also keeping a heavy reign on the player at all times. Let me try to break this down and explain for you in more detail. We play the game as Reza, a young guy who just wants to be the best journalist he can be, and somebody who instead of fighting. He would rather sit back and take pictures and essentially capture the story of what is going on in Iran for all the world to see and hear. Whilst all of this is all ok in a real world sense, it isn't long before Reza is having to try to tow the line between friends and family. 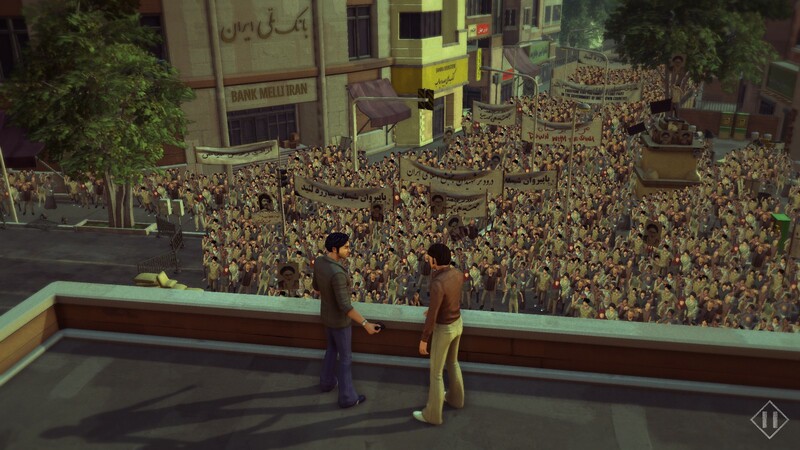 As the story progresses, usually in the form of watching it play out as you choose between four dialogue options or opting to remain silent, you find that the story takes you on a journey of trying to stay loyal to your loyal government and law abiding brother, his friend who just wants a peaceful revolution with no violence as he knows it can be avoided. And lastly Reza's cousin, who all he wants to do his reap havoc and give the government and fellow resistance fighters something to fight for. The game will occasionally let you wonder off by yourself to explore around the very linear pathways they have marked out for you, some areas will be comprised of several mini areas however, but these areas allow you to interact with several key figures as well as learning more about the resistance at that time. By exploring these points of interest you will often find that they are collectibles that will often show real life pictures and give more of an insight into the events of the Iranian revolution and what it was standing for. A key subject to the collectibles if you do decide to try to hunt them down however is that some will give you more insight into Reza who for the most part appeared to be a real person, some of the collectibles will give you an insight into his and his families lifes and how they lived during this time which ended up being quite interesting. Each of the games main 19 chapters however are fairly short, if you are just playing for the story, the longest you may spend in a chapter is about five to ten minutes as you figure out who to talk to so you can progress on-wards. Some chapters will even only last a couple of minutes, however it was nice to see the odd sprinkle of quick time events added in occasionally for action purposes. Graphically 1979 The Resistance isn't ever going to win any aware for its presentation or art style, Some of the characters can look off, and some of the character models are seemingly reused at various points within the story. 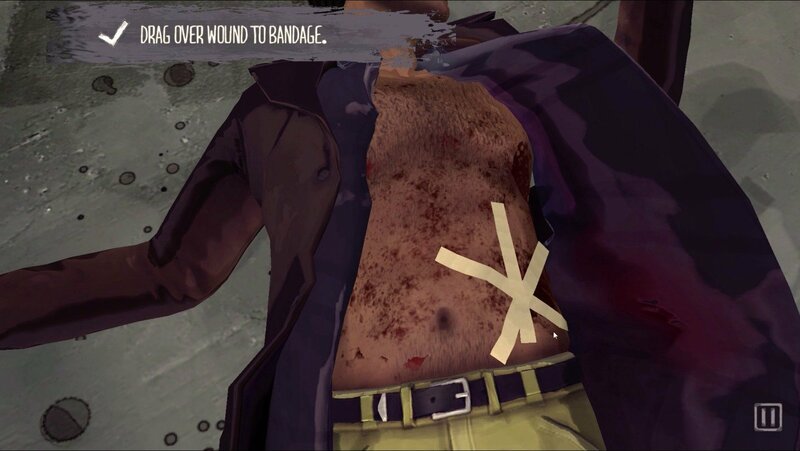 For example at one point during a story mission I opted to have one person killed off only for that character model to turn up again in another cutscene later down the line. Some of the environments however are well presented, and if you do go for the collectibles within the game and look at the photos that were taken during the resistance it is nice to see the developers have taken the time to try to re-imagine these in digital form. The game itself is pretty colorful however, and the presentation of the menu design is actually pretty nice to look at especially if you want to view the collectibles within the game. Some of my gripes however come from the arrows within the quick time events can oddly blend into the scenery sometimes due to their color choices. And one particular death animation towards the end of the game actually had be laughing in a cringe way instead of making me feel some form of sorrow. Overall though the aesthetic and design choices will make you feel a part of the world you are viewing. When the game first begins and you get slowly introduced to the various characters, some of the voice acting is pretty dreadful if I am honest. The accents will sometimes slip and it just feels all kinds of disjointed, however after a few acts these issues slowly getting wriggled out. The voices portraying the characters start to become even more believable and you find yourself getting sucked into the conversations they are having. The voice cast is actually quite large for such a short title, but with there being so many characters to talk and interact with, it is actually a pleasant surprise to see that one person didn't end up voicing multiple characters, instead the developers seemingly got a whole host of voices to step in and do dialogue for them. The audio score and background sounds are all nicely composed though from the chants from the resistance to the army, to gun fire and commotion happening on the streets. To even the music that starts going when things seem to be heating up everything seems so well coordinated and in truth this was one of my more favored areas of the game. I will give huge props to the developers however for giving players the choice of authenticity if they so chose when it came to listening to propaganda messages from the resistance, If you find and play some of the tapes, sometimes you get the option to listen to the message in the native tongue or have it switched to English so you can tell what is being said. This was a nice attention to detail aspect. Difficulty is always a hard one to surmise when talking about a game that essentially plays itself out bar for a few interactions from the player. Revolution falls distinctly into this category also, because due to just watching most of the game play out, you sometimes get to take control of your player. When in control of said character you get to roam around in small enclosed linear areas looking for objects or talking to another person to open up more dialogue options for a later point or just to progress the story naturally. You occasionally get met with quick time events that you can fail if you are not careful which will lead to the characters sadly demise, but these are a little bit few and far between and when they do show they never stay around long enough to cause any real issues. Lastly the camera interaction sections also never pose a threat either as usually the game will hang around until you snap everything you are meant too, or until a hidden timer runs out and the game proceeds on-wards with the story. In truth the most difficult thing you will encounter with this title is the choices you may have to give the various characters you meet and talk too. Do you want to play the pacifist who tries to make everybody happy, or do you want to join the revolution to the max and see where it leads. You will find yourself struggling to draw a line straight down the middle. Achievement wise, their is quite a lot to try to accomplish here if you want to get the full 1,000. Saying that however you will easily be able to snag every achievement within the game if you plan properly. At the very least you will need to play through the game twice to get everything, as there are achievements tied to who you decide to save within the game and also your actions throughout the title, if you decided to be violent or peaceful, you will get achievements based upon your actions at the end. You also get achievements for helping individuals and essentially gaining their trust within the game, and also many of the games achievements can be earned for going after all of the collectibles within the game. Every category of collectible has an achievement attached to it. Most of the achievements on offer within the game however come just purely from playing the story, however this will only net you a small amount of the gamerscore that comes with the game if you only decide to do the story and nothing else. Revolution 1979: Black Friday is a title I fear may sadly get overlooked by many a gamer. The title tells a lovingly crated true story of a journalist who wants to do right by everyone, but also wants to play his part by just telling a story in the name of pictures before ultimately being dragged down into the resistance for the revolution. Whilst the story itself is barely over an hour long if you don't spend the time to look for all the collectibles which add so much depth into what went down around this time. In truth you may find yourself feeling compelled to search out all points of interest so that you can discover just a little bit more about one of the most brutal times within Iran. Oh and did I mention that the story is really good too? Do yourself a favor, if you have a little bit of spare money, or not sure what the next game to pick up should be, grab this. I think you may come away feeling as pleasantly surprised as I did after my time with it.